Okay, first, allow me to address the obvious: Big Sean isn’t “big” at all. If I were a betting gentleman, I would wager that Big Sean weighs somewhere in the universe of 150 to 170 pounds. I could be incorrect. Nonetheless, the fact remains unchanged – Big Sean is a gentleman with a slender frame. And thus, I find this month’s endorsement by GQ mildly amusing. 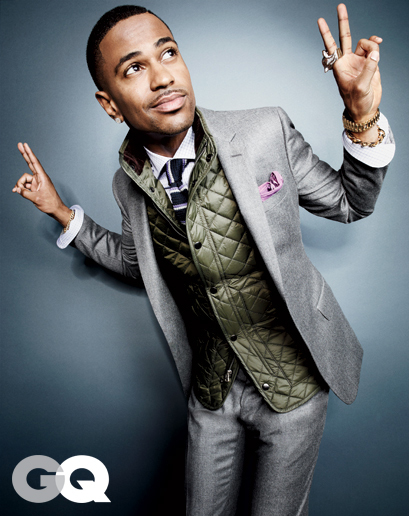 In a pictorial showcasing down field vests, Big Sean is modeled with the aforementioned vest layered comfortably under his sport coat. Apologies, but for an average gentleman with a modest amount of weight on his frame, this look is preposterous. I understand what GQ is trying to achieve here, but if “Big” Glen tries to squeeze a down vest under his sport coat, he would probably suffer two collapsed lungs from the subsequent pressure being applied. My advice: forgo the business jacket and secure yourself a toasty hat and pair of gloves to keep warm. Better yet, how about wearing, say, a regular cold weather coat over your ensemble? Because, cramming yourself into a blazer or sport coat for the sake of layering, can be really distressing. And when it’s cold outside, we have better things to worry about than shifting around uncomfortably in our gear. What say the audience?